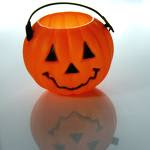 We've all seen those $1 plastic pumpkin Trick or Treat buckets at Target and Wal-Mart. 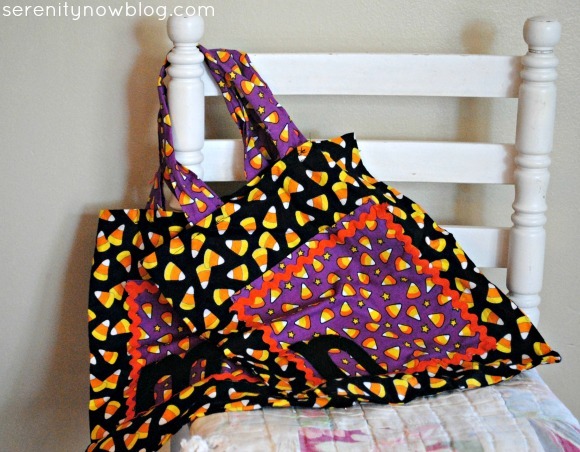 I decided I needed some creative time yesterday, so I sat down while the girls were napping and made a Trick or Treat bag with some Halloween fabric I found in Wal-Mart's fabric department. 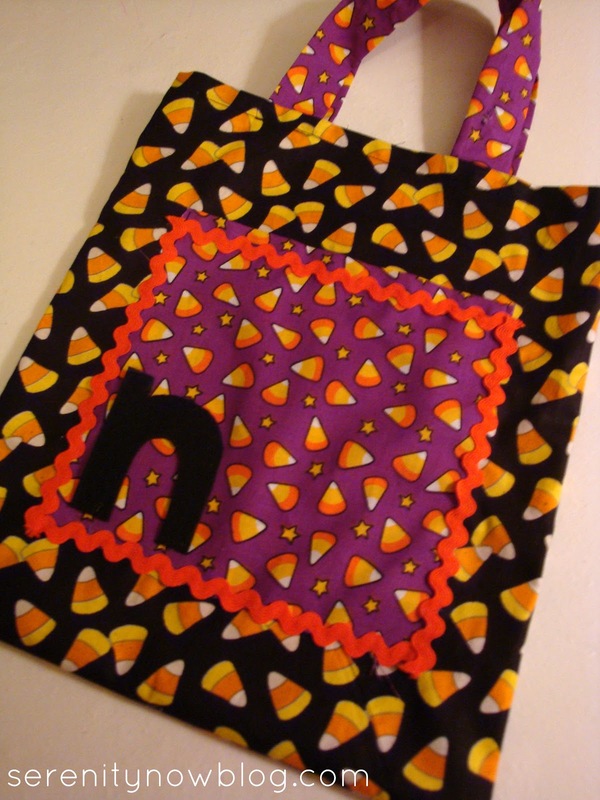 I had been looking in JoAnn's, but they were pretty picked over, and I fell in love with the candy corn fabric I found at Wally World. I should make a disclaimer here that I am pretty new to sewing. My skill level could be classified as EXTREME beginner, and if you have any sewing experience at all you may just want to skip to the end to see the finished product because my methods might make blood shoot out of your eyes. Then I cut out through the two layers to create two pieces that were roughly 12 x 14. I measured a half inch seam on the top of each piece for the opening of the bag, pressing and pinning to make sewing easier. See how much easier it is to sew when the seams are crisp and pinned down? Then I cut a square of a contrasting fabric to go in the middle on the front of the bag as a pocket. I pinned, pressed, and sewed a straight seam across the top of the square first so the pocket would have a finished opening. This, of course, had to go on the "right side" of the fabric since it would be an outside pocket. Leaving the top of the purple square open for the pocket, I sewed around the rest of the square, making a very small seam. I used some of the leftover purple candy corn fabric to create some handles for the bag. I just measured and cut two long rectangles that looked like they'd make long enough handles. I folded the purple rectangles in half with the "wrong side" of the fabric facing out, then pinned them. After I sewed those seams, I had to turn the straps right side out. Then I pressed the handles so the seam would be in the middle of the back. Pinned the handles on where I thought they'd look nice. Then I sewed straight across the top, making sure the seam went through the handles and made a nice seam on the top of the bag opening. After that, I just had to sew around the rest of the bag to pull it all together. Then I got out my BFF, Fabri-Tac, which has stayed with me through several projects. I used the adhesive to glue some orange rick-rack over the pocket seams on the front of the bag. Very easy to use, doesn't burn your fingers, and dries quickly. All that was left was to hot glue a stiff, black felt "n" (for "Natalie") to the front of the new bag. Tomorrow, I'll make an "m" bag for Michaela Byrd. This project took me some time because the girls kept interrupting me after they woke up from their naps, but once I decided on what I was doing, it was really easy. 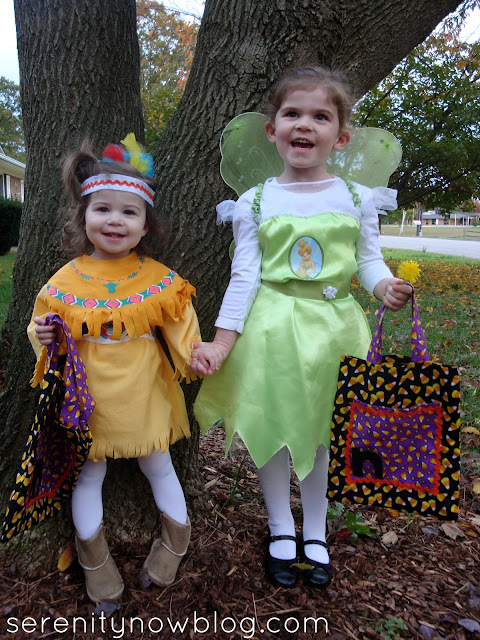 Here's how they looked "out on the town" last year... my little Tinkerbell and Tiger Lily from Peter Pan! If you enjoyed this post or found it helpful, I hope you'll click your "Pin it" button to add this post to Pinterest or a +1 for Google+. thanks for reposting-i hadn't seen this-so cute! this would be great for me because then my kids couldn't fight afterwards over whose bag is whose-their initial would be right on it! 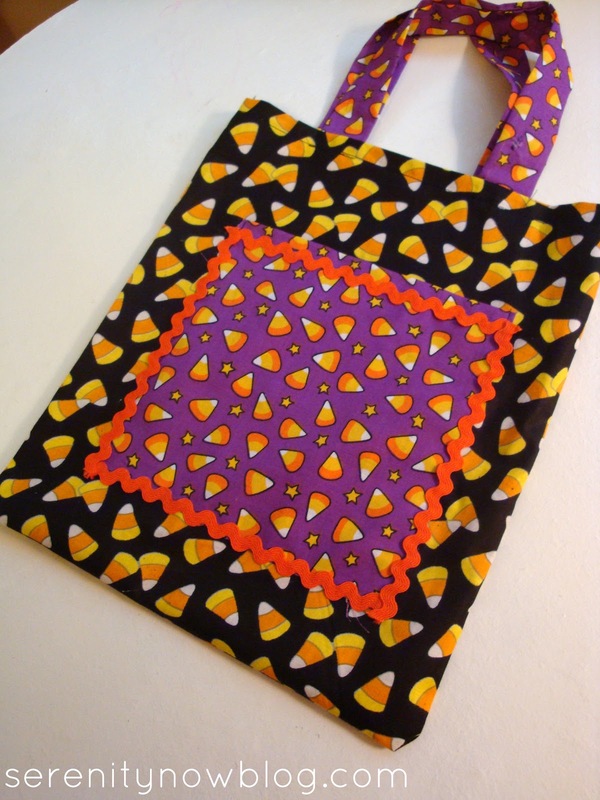 This is such a good idea, and your little trick-or-treaters are just adorable! A great entry for the CSI Project. And a great tutorial--you make it look very doable, even for beginning seamstresses. Oh my word...was this a year ago? The older I get, the faster time flies. Those are adorable bags! I think I will use your pattern/tutorial to make little library bags for our boys. Thanks for reposting it so those of us who weren't around last year get to drink in your great ideas! Those bags are too cute! I love how easy bags can be too make. I overthink sewing projects a lot, which keeps me from trying new stuff. Fantastic Amanda! You've inspired me to make some of those trick or treat bags for my own kids! Love love love those cute kiddie costumes! You're such a great mom! Those are adorable! I really need to make some of these for my kids! The girls are soooo cute!!! I never would've thought of Tiger Lily! Precious! Too stinking cute! The bags are cute, too ;0 ! My grandma made us bags like this when we were little! So cute! & I think I was Tinkerbell about 3 years in a row (: I'm excited to see pictures of your girls this year in their costumes! Ah these are precious! I’m jealous of your sewing skills. Look at all the neat things you can do! How cute! They are going out in style. I would totaly buy that for trick or treating. What an adorable bag!! And I too love the Fabric glue...but many times, it drives me crazy. It comes out of the tube so quickly and then keeps coming and coming and coming! What a mess I can make sometimes. But the glue itself is fabulous! Now that is a cute idea! And your girls are darling in their costumes! Great idea. I am an extreme beginner at sewing myself, so this was a great tutorial :) I can't wait to make these for my little munchkins. I am SO impressed, Amanda! My sewing skill level would be ranked with yours, but I think you lied. ;) These are adorable! What an adorable bag! And it can be used each year.